Are The “Innovative” Re-Timer wearable SAD Light Glasses A Step in the Right Direction? 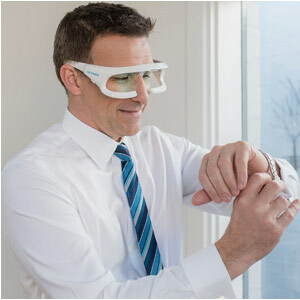 The Re-Timer SAD Light Therapy Glasses are something new and “innovative in the treatment of mood and sleep disorders that should catch the eye of many potential buyers. There are many different lamps and devices on the market for the treatment of SAD and they all try to find the perfect shape and perfect way to emit light to help users overcome their disorder. These glasses are appealing to sufferers because they take an entirely different approach and eliminate the need for those bulky lights that take up so much space on desks and workspaces. These glasses are an interesting idea but are they really able to make a positive difference? 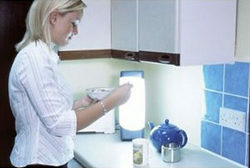 LitePod SAD Light box is a compact SAD lamp that helps relieve the symptoms of Seasonal Affective Disorder (SAD) and is ideal to use around the home or in the office. The LitePod SAD light box is among the smallest SAD lamp in the market that emits 10,000 lux of light. It’s even small enough to position below the computer screen. Despite its small size, the LitePod’s 10,000 lux light delivers full treatment of up to an hour. It is discrete, small, stylish and effective in treatment of SAD with regular use.